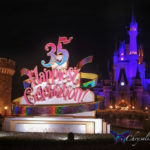 The 35th Anniversary “Happiest Celebration” festivities are in full swing at Tokyo Disneyland, and the “Dreaming Up!” parade was definitely a highlight. 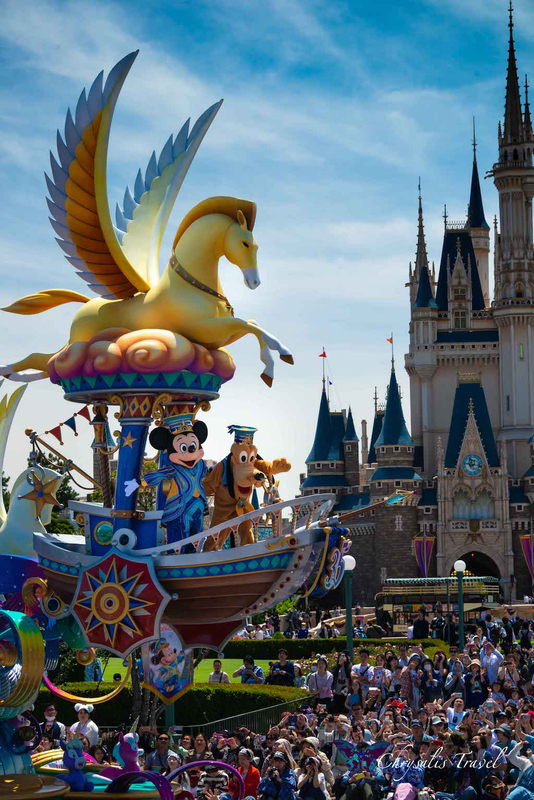 The Tokyo Disney Resort is known for excellence: innovative attractions, one-of-a-kind parades, unique seasonal food, and an unmatched passion for everything Disney. 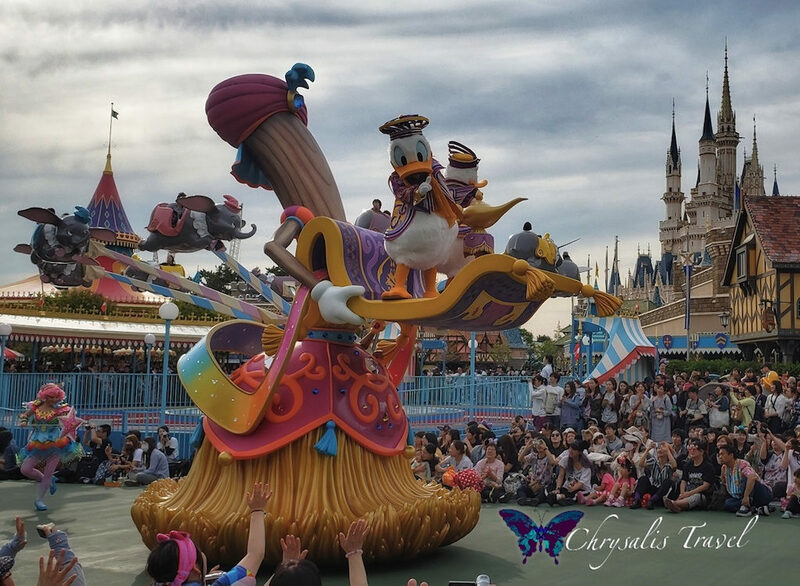 The “Dreaming Up!” Parade premiered on April 15th, 2018 and has been popular amongst park guests. 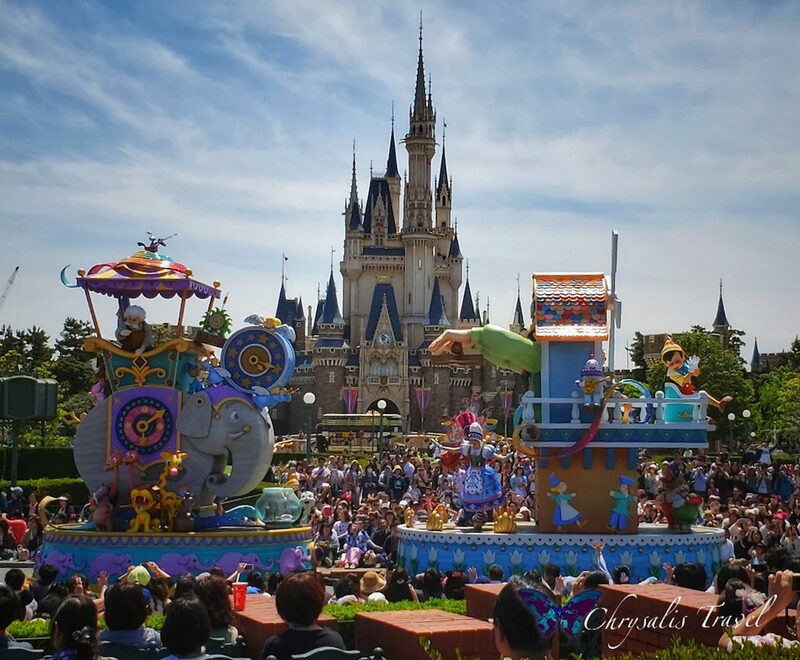 It features Mickey and friends in a world of “fantasy and imagination.” However, there is still much nostalgia surrounding the last parade, “Happiness is Here,” which ran since Tokyo Disneyland’s 30th Anniversary in 2013. 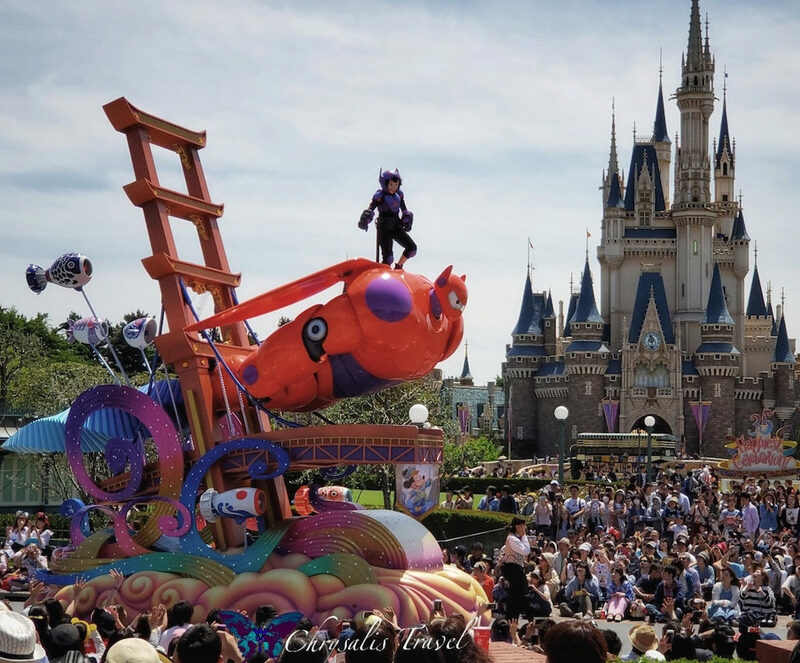 During my four days at Tokyo Disney Resort, I saw “Dreaming Up!” four times. Rain and shine. 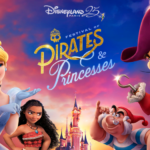 I enjoyed the hummable soundtrack and was impressed with a couple floats in particular. Here’s a closer look. 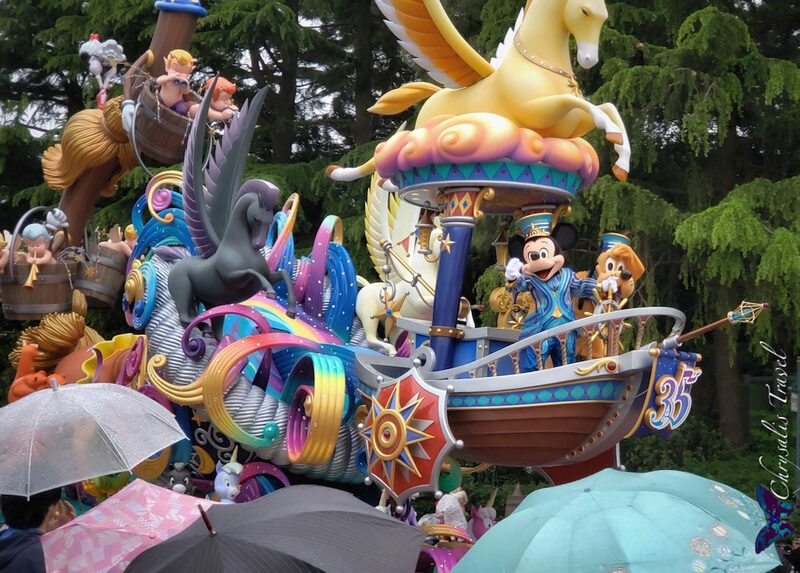 Mickey and Pluto lead the way in a Fantasia-themed float powered by winged horses and heralded by cherubs. Each character is dressed in their 35th Anniversary Celebration best. 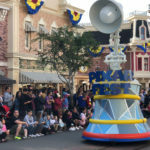 I am always impressed with how every parade runs daily, rain or shine (even the Electrical Parade). There are some modifications, but I really appreciate Tokyo Disney Resort’s sensibility about not disappointing guests with cancellations. What surprised me this time was that they allowed guests to use umbrellas along the parade route. In the past, it seemed that cast members had everyone close their umbrellas to improve visibility for other guests. Perhaps also boosting raincoat sales. 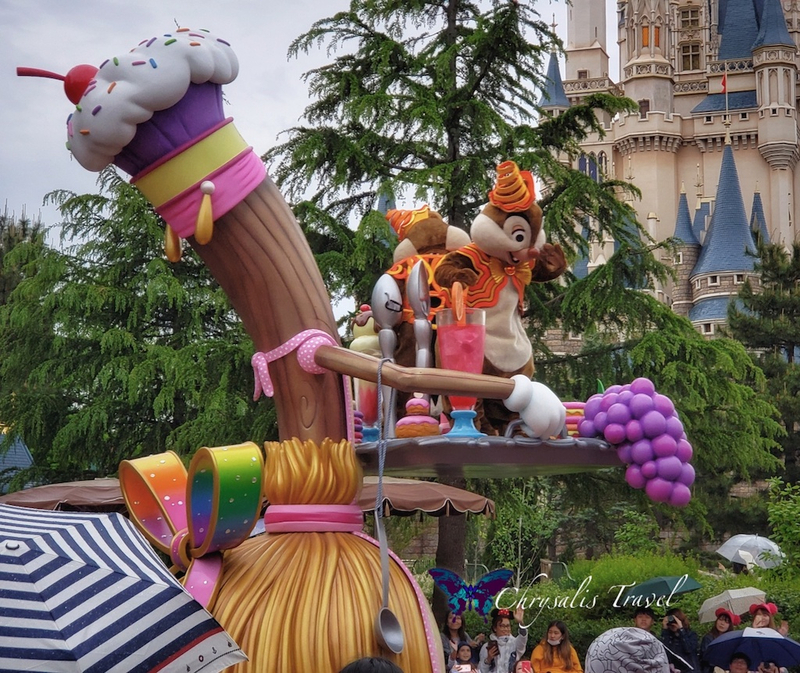 Small Fantasia broom-floats with favorite characters are spaced between the larger floats. Goofy leads the first one. Alice in Wonderland follows, joined by a very merry un-birthday tea party with Mad Hatter, White Rabbit, and March Hare. 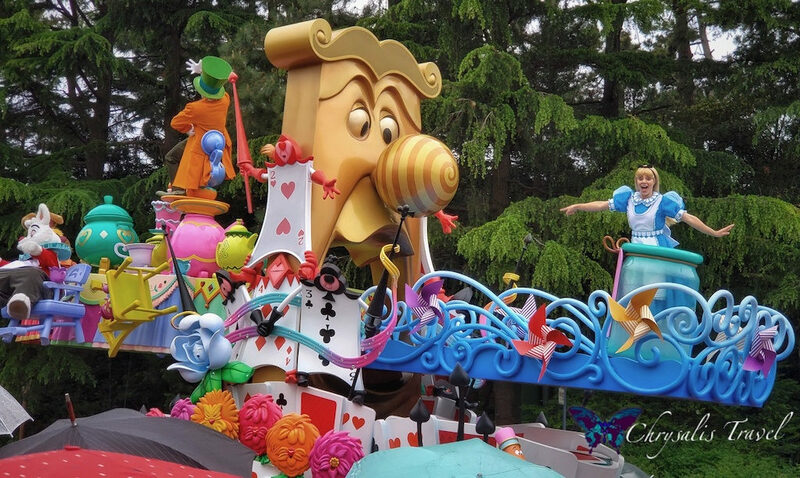 I enjoyed the whimsical design and can’t remember the last time I saw March Hare on a float. The Red Queen marches along, playing croquet. Pinocchio tries to prove he’s a real boy, as Stromboli lurks behind as the puppeteer. Geppetto rides atop an elephant and is surrounded by creations from his toy shop. 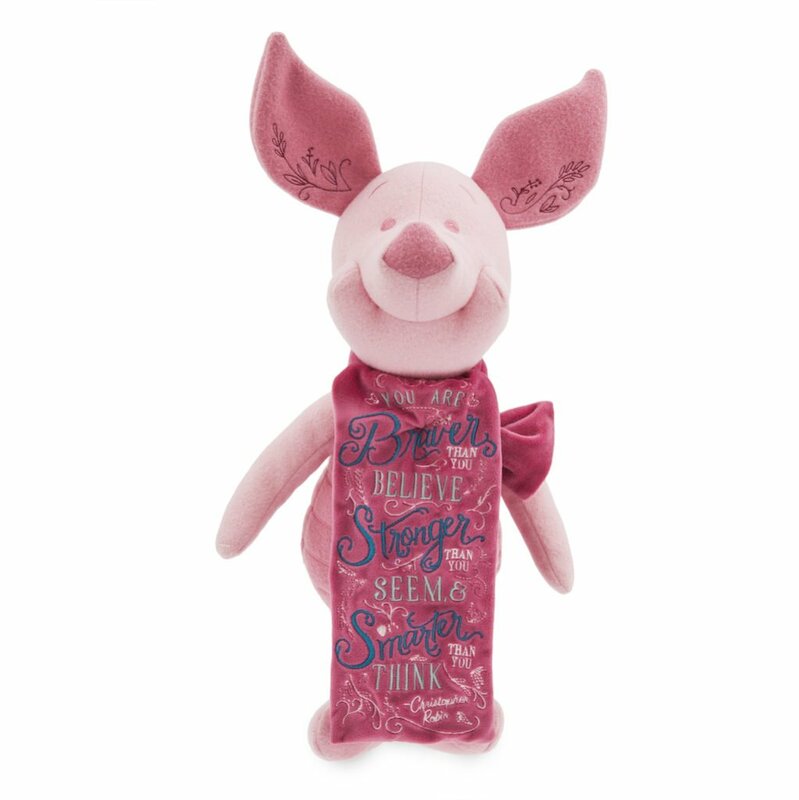 Minnie – looking fabulous in her tiara – sports swirls of ribbons instead of polka dots on her red “Happiest Celebration” dress. She heralds the coming of the Princesses. Matching Minnie ears are, of course, available in stores. Cinderella’s Fairy Godmother leads the long Princess float. Tiffany-lamp colored stained glass covers the four Princesses: Rapunzel, Snow White, Cinderella, and Aurora. 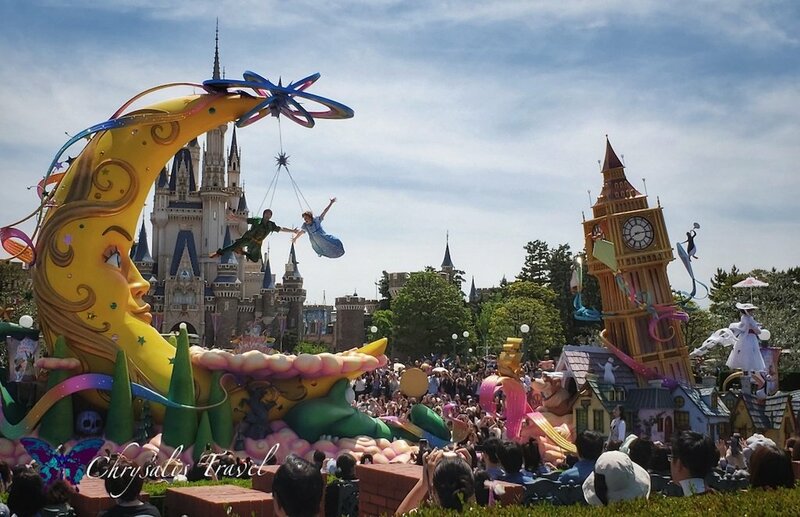 This float was particularly difficult to photograph because the ‘crowns’ in the columns actually obstruct view of the Princesses except from limited angles. And, they were usually waving in opposite directions. Usually, when I picture Beauty and the Beast in a parade, I see Belle in her classic golden gown. 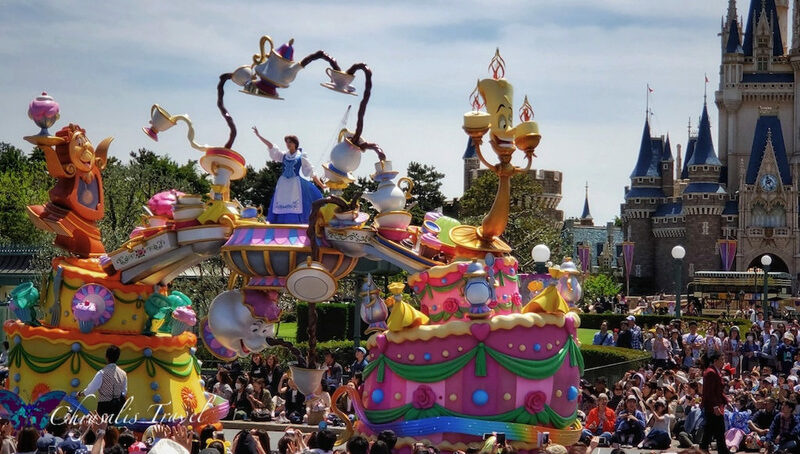 This food-themed ‘Be Our Guest’ float features Belle in her blue dress. There is nothing simple about this gown, though. It is actually covered with embroidery and lace details. Belle dances along with her culinary entertainment featuring Lumiere, Cogsworth, Mrs. Potts and Chip. When Winnie the Pooh falls asleep, he dreams that Heffalumps and Woozles steal his honey. 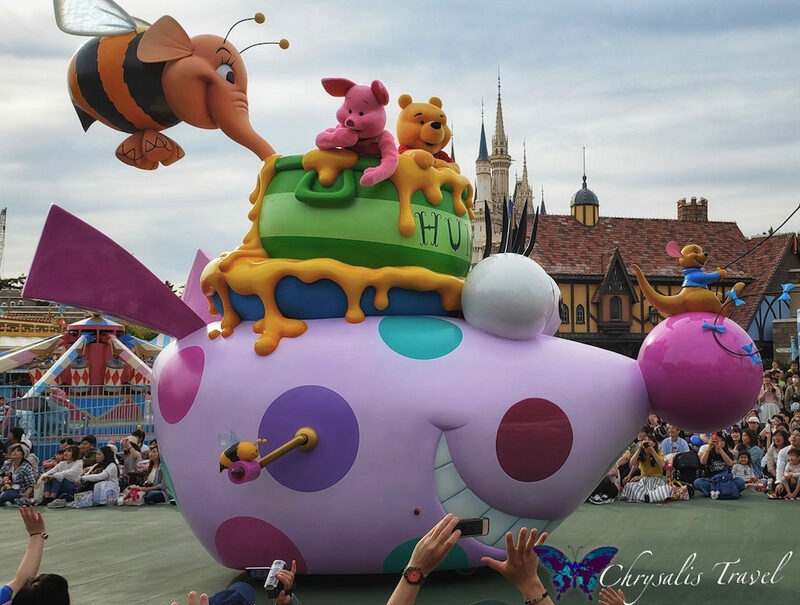 In the parade, Pooh Bear sits with best friend, Piglet, in a Hunny Pot, trying to hide from a Heffalump. Tigger follows with a host of Woozles. Donald and Daisy take a magic carpet ride on their broom float, dressed in their festival best. 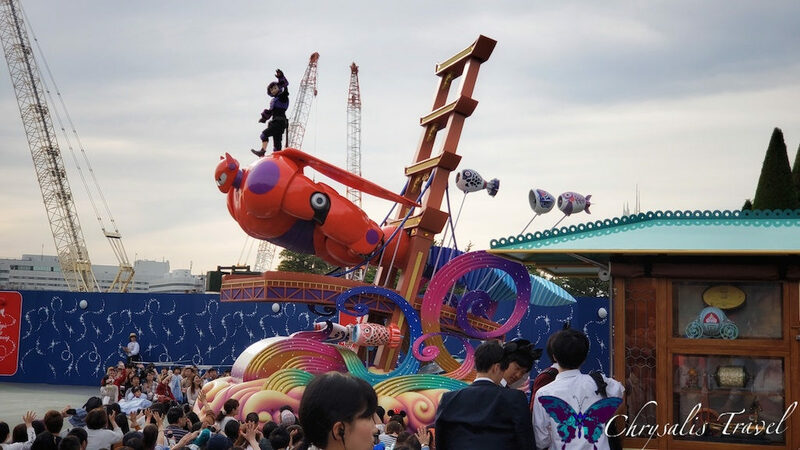 For the first time, a Big Hero 6 float joins the procession – and it’s impressive. Hiro rides atop armored Baymax as they soar above San Fransokyo. It was particularly interesting seeing Baymax go through Fantasyland / Tomorrowland. In the background, the large construction cranes are creating the first-ever Big Hero 6 attraction for Tomorrowland, as well as a new Beauty and the Beast attraction. This photo also illustrates a fascinating aspect of Japanese culture. This popcorn cart across from Pooh’s Hunny Hunt sells Honey-flavored popcorn, which is only available here. Cast members roped off an area especially for guests to purchase Honey popcorn, even during the parade. While surrounding viewing areas were packed, guests wishing to purchase popcorn were welcomed into this generous space and not inconvenienced by the parade. Brilliant. London, Ahoy! Mary Poppins in her Jolly Holiday dress floats magically in front of Big Ben and the city of London below. She is surrounded by penguins on flying kites and accompanied by Bert dancing with more penguins. Creatively, the second half of this float also ties in with Big Ben. Peter Pan and Wendy escape to Neverland by flying to the moon in an extraordinary, spinning acrobatic display. All under the watchful eye of the Crocodile. I loved the aerial design on this float. For safety reasons, Peter and Wendy did not fly in the rain. Sponsor NTT docomo (a cell phone service provider) wraps up the “Dreaming Up!” parade. 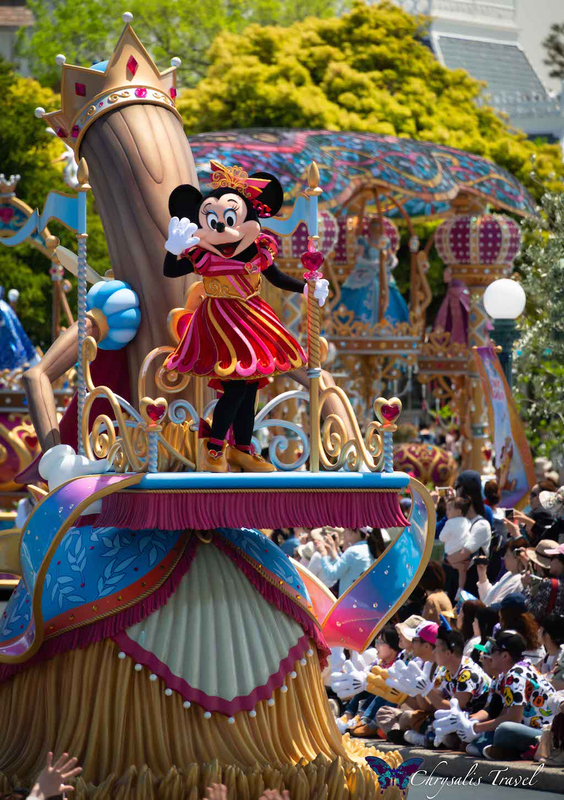 What do you think of the “Dreaming Up!” parade? 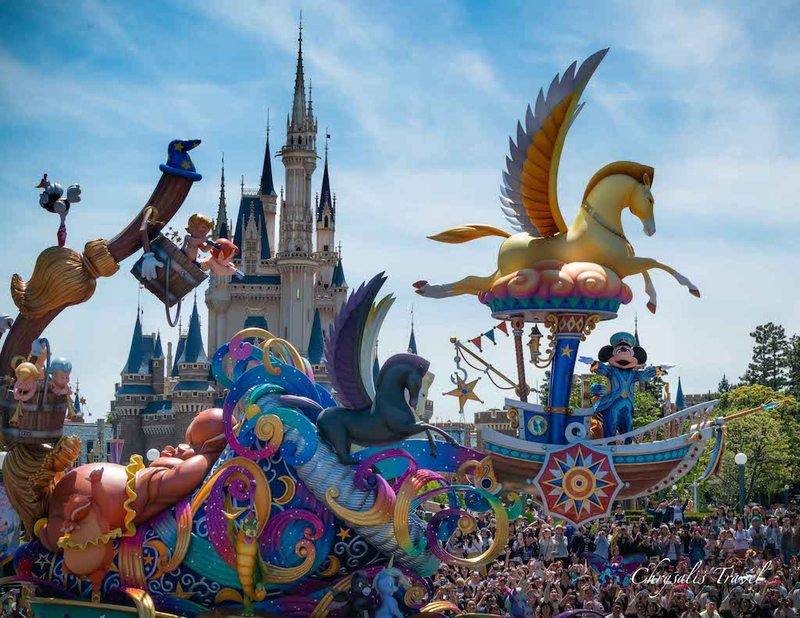 Does it measure up to “Happiness is Here?” How about “Festival of Fantasy?” Share your thoughts with us! 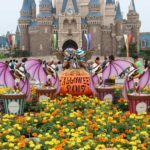 Of course, a visit to Tokyo Disney Resort would not be complete without exploring the festivities at Tokyo DisneySea, getting a glimpse of the exclusive Tokyo Disney merchandise, and salivating over a dizzying array of seasonal food items. Ready for a glimpse? 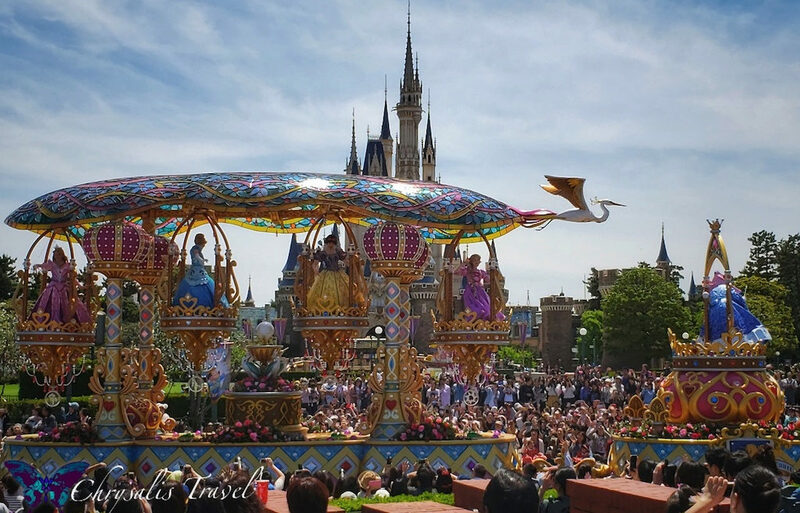 Follow us as we take a closer look at these aspects of the Tokyo Disney experience.